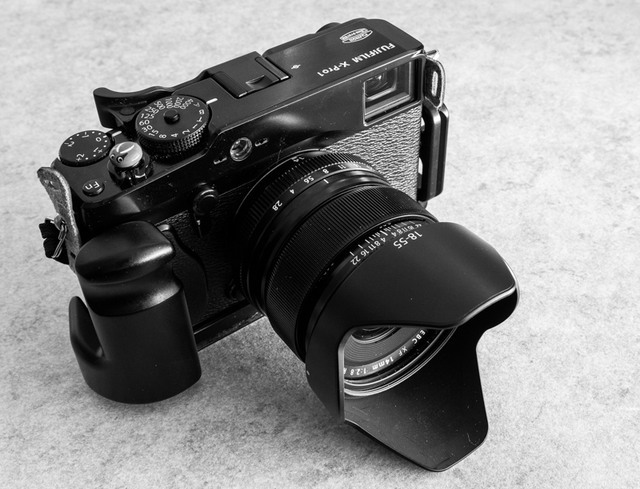 The Fujifilm Xpro 1 is a superb camera and many photographers are singing its praise while making great images from this unique and high quality digital rangefinder. There are a few pieces of gear that can really enhance the Xpro1 and this post is dedicated them. After using the camera for a year and a half and having a load of friends also indulge in the Xpro1 I built this list with authority. 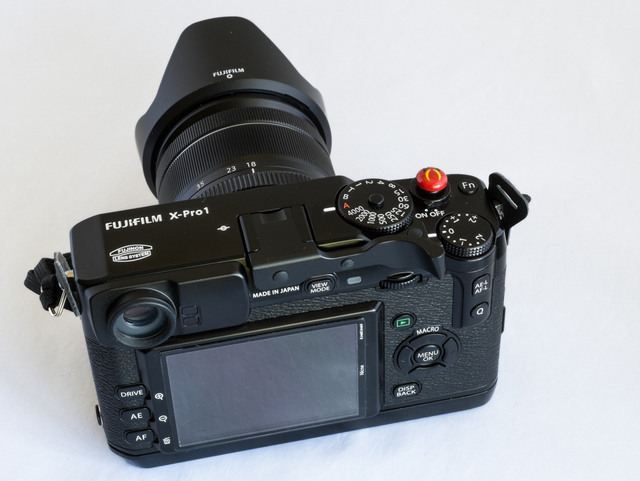 Some of it can apply to the XE1 and XE2 and some can’t, I’ll let you know so all Fujifilm X system shooters can benefit from these suggestions. So here we go, the 9 essentials. #1 The Domke 1” Gripper Strap with QR. The strap that Fujifilm supplies is worthless. While looking nice and being leather it is too thin and slips off your shoulder every 3 steps you take. The Gripper is thus named because it has two rows of rubber woven into the strap and the rubber keeps the strap from falling off your shoulder. The Gripper Strap has quick releases so it’s easy to remove for tripod shooting. The finish of the strap is also attractive and stealthy; it looks good and doesn’t get in the way. It comes with leather protectors so it doesn’t scratch the side of the camera and also features a nice leather accent. Anything that is this functional and under $20 bux is a winner. Works with Xpro, XE1 & XE2. #2 The Hand Grip HG-Xpro1 This is sort of a no-brainer. It gives you a better grip and brings the tripod socket to the middle of the camera, not off to the side. Yes, it’s a bit annoying to take on and off when you want to access the battery or memory card, but its easy to remove and put back on. I keep it on about 80% of the time for standard walk about shooting and when I want to go low profile (shooting discreet at performances) I simply take it off. It has a nice thick rubberness to it, and when using large lenses such as the Zeiss 12mm, Fujifilm 14 or any of the zooms it simply shines. I like the feel of the camera without it, but really like the feel with it. It also has a rubber bottom so it can’t scratch surfaces when you put the camera down and keeps it from slipping off slick surfaces. Coming in at $79 it wont break the bank either. The link I provided will show you both grips. #3 Blue LocTite for the Eyepiece. A very small drop of blue Loctight is great to keep the stock eyepiece from falling off. I have replaced mine once already and it’s costly! Don’t use the red Loctight, that’s permanent! The blue is made to resist unscrewing but is not permanent for servicing. Make sure you shake the tube well before application and once again, just a small drop or two. You can find this at your local hardware store. Only Xpro1 users need this, the viewfinder in the XE is cheesy. #4 Gaffers Tape the hood cap that Fujifilm provides. I lost my hood cap in about.. 12 seconds. Take gaffers tape and line the inside of the hood with about 2 layers of the tape, it just makes the lens cap fit more snug. Besides, you should always have a roll of gaff tape handy for just about anything. Use it to gaff tape the Fujifilm logo when shooting in sketchy locations (an old photojournalist trick). #5 LCD Screen Protector: Your XPro1 is a constant companion, its right place is around your shoulder going where ever you do. It’s bound to get beat up, and that’s ok, because it’s a tough camera. But man, that LCD cover is soft! Look at it the wrong way and it gets scratched. Get on this one right away and put a cover on it! I know, you’re discerning, so try this Aegis Professional Multi-Coat Glass cover, it’s made from Schott glass and is only $30 bucks! 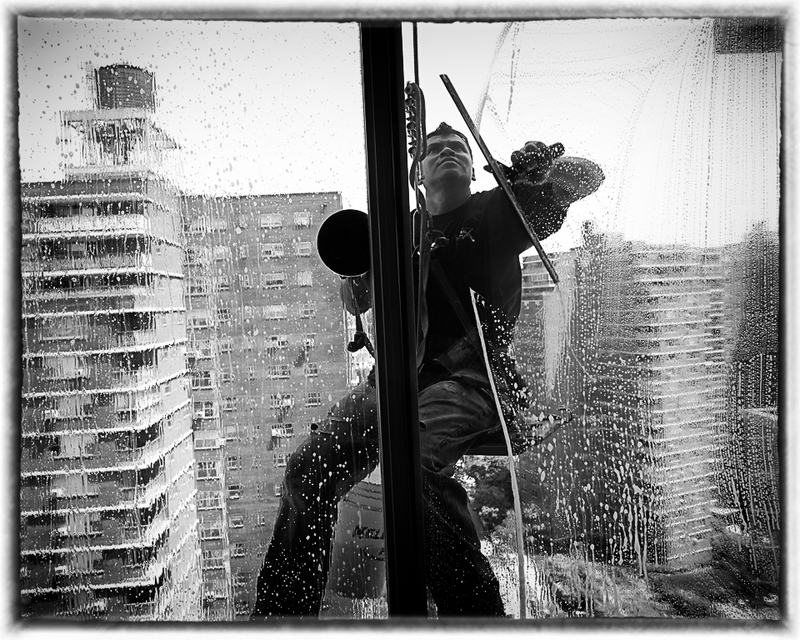 It is easy to install and its tougher than the stock glass on the Xpro1 LCD. #7 Camera Bags: There are only two to consider. Going stealth and relatively inexpensive the Domke F5XB is your huckleberry. 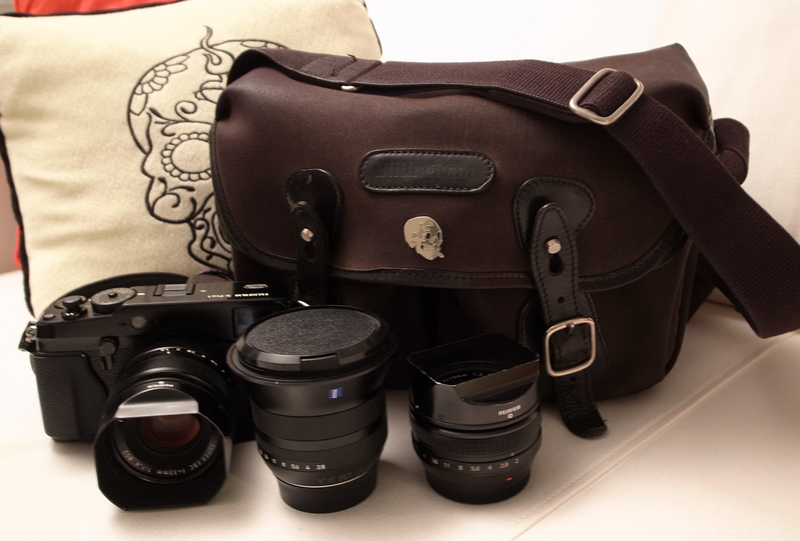 It was designed primarily as a rangefinder bag and can hold the camera with a lens mounted on it and two more lenses. It’s canvas and discreet, you can wear it over shoulder or on the hip with it’s integrated belt loop. I like the black, but you can get it in olive or tan. If you never had a Domke bag you’re in for a treat, they age very well and at $70 dollars, wont break the bank so you can buy more lenses as they are released. Now if you have some $$$ to spare and are looking for something very special, look no further than the Billingham Hadley Small Shoulder bag. It’s like the Louis Vuitton of camera bags, made with a luxury canvas and gorgeous leather trim this is a camera bag that you can take to museum openings, the opera, or to Pakistan. Easily handles a body with lens and two extra lenses like the Domke, but also has two deep large pockets at the front for important extra stuff such as batteries and a hood loupe. Hiding behind the camera insert is an area that you can fit a iPad tightly or a iPad Mini easily. I personally have owned one for over a decade and while the insert’s Velcro has worn out, I replaced it and gave it new life. I don’t want to sound vain, but the Billingham Hadley really is a classy camera bag and you can be proud to tote it around. Coming in at $240 dollars it’s not cheap, but my daddy says, “good things are not cheap and cheap things are not good”. Hey you only live one. Works with Xpro, XE1 & XE2. #8 Cable release: It’s not a big deal until you go to need one. Shooting fireworks, long shutter speeds in front of waterfalls, or macro work the cable release is part and parcel to the whole reason to mount the camera on a tripod. Sure you could set the timer to 2 seconds, but nothing connects to you to your camera more than a cloth sheathed 12” of wire. The Nikon AR-3 is a high quality shutter release that has been around for ever, it’s locking so you can keep the shutter open for hours if need be. It’s a simple design, that wont break the bank and once again, it’s proven quality. Works with Xpro, XE1 & XE2. #9 Extra Battery: Get one. You’re going to need it. The Xpro1 is only good for about 225 to 300 shots before it dies. When it goes, it goes fast. It may read two bars, but that really means you have about 20 shots left. I don’t complain, I just keep an extra battery in my bag. So get one, keep it charged and keep it in your bag. This battery works with Xpro, XE1 & XE2. I hope this helps. Feel free to share you own suggestions. I second the Domke gripper strap. It has swivels on it so the strap will never get twisted. The rubber grippers stop it from sliding around. Have one on my X-E1 and my Leica 8X32 binoculars. Hi David, Thumbs Up thumb rest that fits into the hot shoe on the XP1. Yes it removes the hot shoe/flash functionality, but I didn’t get the camera to shoot with a flash attached. The thumb rest improves my camera grip and keeps my fat thumb from inadvertently pushing other buttons. I found the thumb rest vastly overpriced and never went for it. I really like the idea of the blue Loctite threadlocker for the eyepiece, but I haven’t had any problems with mine coming off…yet. But, I will do it anyway just to be safe. Bag: I find the ThinkTank Retrospective 5 is perfect for the X-Pro1, with one lens on the body, and two other lenses in other compartments, with pockets for lens and body caps, batteries, microfiber cloth, etc., and the all important cable release. The back compartment will accomodate an iPad Mini. You can even secure another lens on the side of the bag in one of the padded lens cases that attach to speed belts if you need to carry a fourth lens (like the new 23!). Regarding the soft release: I had one, but I think it contributed to a failure mode of the shutter button completely freezing and not being able to actuate the shutter; had to send the camera back to Fuji for repair on this one. I think this was due to constantly having to re-tighten the soft release in the threaded shutter button, and the torque applied in doing this caused the shutter actuation failure mode. I won’t be going back to using a soft release; caveat emptor is my guidance on a soft release. OTOH, I find the Match Technical ThumbsUp thumb rest to be essential for providing excellent purchase on the camera in conjunction with the RRS grip and it also prevents me from accidentally activating the Q menu button inadvertantly. Agreed on the cable release and screen protector. Essential! I would add a thumb grip from MatchTechnical to any and all of them. Once I put one on, the camera didn’t feel right without it. Absolutely agree! Now that I’ve used one, my camera would not be same without my Match Technical ThumbsUp thumb rest. Ok you all got me, I’m going to try a thumb release. My Fujifilm contact told me one machine shop makes them for Ff in the USA and that’s why they are $$$. Small batches hand made. The machine shop that makes the thumb rest for Fuji *is* Match Technical. You can save $$$ by buying from a Match Technical dealer. I got mine from PopFlash Photo. They are in fact, CNC-machined from solid brass, and they fit and work very, very well. You will love it once you have one. I recommend getting chinese batteries on ebay. I Highly recommend going original. Working for B&H I have learned to stay away from anything but the factory battery. They cost a bit more but are worth it. I have quick-release brackets from Really Right Stuff on my Xpro-1 and my EX-1. They provide the obvious tripod mounts, but also a very nice handgrip on the right side of the camera AND they allow easy access to the battery/memory cards without removing the brackets. You forgot about the most important accessory or all; a garbage can in which to drop the X-Pro into, along with all the other nonsense. That’s an apochromatic garbage can to you sir.